This article will go over how to create your catering hours of operation. Remember as an employee you can always override these hours by clicking the Ignore Time Warnings check box in the Order Entry tab. If the customer places an order outside of your operating hours they will be prompted to call the restaurant directly to continue with the order. 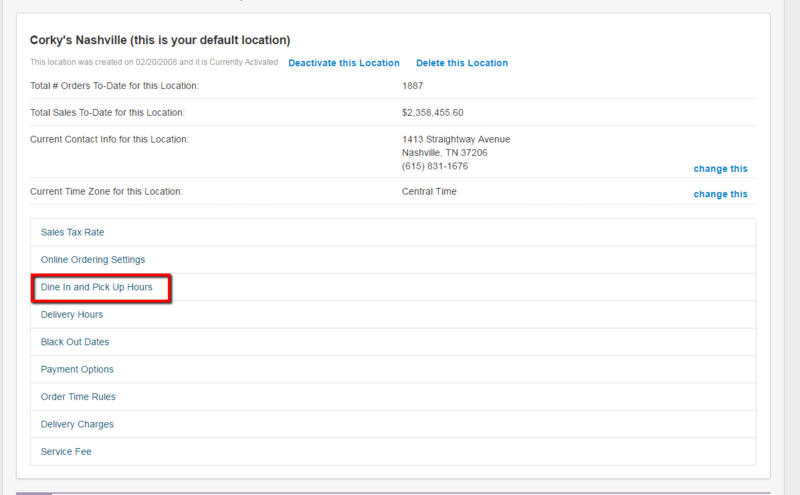 1 - Click on the Admin tab - look for the Restaurant Locations sections - and click on the bubble for the Location that you want to work with. 2 - Next click on the Dine In and Pick Up Hours link. 3 - The next box that you will see will be where you can set the hours of operation. Please note the days of the week listed to the left side. Please note to mark your restaurant as closed click the check box to the right. Make sure to click SAVE after setting your hours. You have now set your hours of operation. To set different delivery hours please see the article called Delivery Hours.